Towards the end of the twentieth century, Native American writers Cerald Yizenor, Leslie Marmon Silko, and Sherman Alexie began to populate their fiction-in defiance of the American reading publics expectations-with Indian characters who were not only contempo-rary rather than historical, but also city- rather than reservation-based. Like the historians who, a decade earlier, nad revolutionized American thinking about the countrys history by finally acknowledging the Native American view of it "from the shore," these three writers, in their books about urban Indians, challenged contemporary assump-tions about Indian identity the demise of tribal cultures, and the lndian s place in modern society precisely by assuming as their van-tage point the urban or "concrete shore." 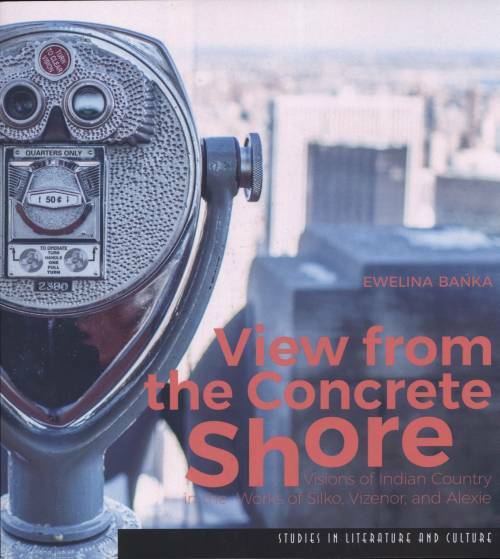 The various psychological, political, and artistic ramifications of their choice of perspective arę the subject of Ewelina Bańkas rich and rewarding critical study View from the Concrete Shore. The author s special focus in the book is on the reconceptualization of the conventional notion of "Indian Country" which inevitably takes place in Vizenor s, Silko s, and Alexie s fiction, as they introduce their readers to the world of urban multi-tribal com-munities and urban trickster heroes.